I was curious to find out more about Somewhere Over The Rainbow, and it's writers, Harold Arlen and Yip Harburg. It's always been one of my favorite songs but I confess, I didn't know anything about the writers. I asked Harold Leventhal what he knew about it. Harold's been in the business for a long time and worked with such legends as Irving Berlin, Benny Goodman and many, many others before deciding to become the business manager for the-soon-to-be-blacklisted Weavers in the 1950's and manager/producer of such prominent artists as Pete Seeger, Bob Dylan, Joan Baez, Judy Collins, Jacques Brel, Miriam Makeba, and so many others. I knew he'd have the real scoop. He had more than the scoop. He had a book. "Songs have been the not-so-secret weapon behind every fight for freedom, every struggle against injustice and bigotry: "The Marseillaise," "The Battle Hymn of the Republic," "We Shall Overcome," and many more...."
My curiosity peaked, I returned to my reading. Following the success of The Wizard of Oz, Harburg went on to create the Broadway hit Finian's Rainbow, a story founded in social protest. Hey! Wait a second! Isn't that the very same Rankin Woody refers to in his lyric "Eisler on the Go", recorded by Billy Bragg on the Mermaid Avenue CD? Crosby?! This is weird. That's the guy who made Irving Berlin's White Christmas (#2 on the list) famous?! Now, pay attention! This is where the story gets really bizarre....!! Wowie kazowie!!! I'm freaking out at this point!!! I wonder if they ever met? I wonder how Harburg knew of Woody? Yip Harburg united the worlds of Broadway and Woody Guthrie. Then he was blacklisted. One worked under the stage light, the other under the sunlight. I also had to laugh. The headlines could have read: FLASH!!!! BLACKLISTED ARTISTS GIVE US TWO OF THE TOP THREE SONGS OF THE CENTURY. Congratulations to Yip Harburg. I always knew there was something about Somewhere Over the Rainbow.... now I know. It was you. If you'd like to learn more about this wonderful man, Yip Harburg, check this book out: Who Put the Rainbow in The Wizard of Oz? (The University of Michigan Press, 1995) Contains alphabetical list of Yip Harburg's Song Titles (537), a selected discography and selected bibliography. On March 27, 2001 the film Man In The Sand was released on DVD by Palm Pictures. This film documents Billy Bragg's quest to learn more of Woody, his travels, and those he came in contact with along the way. It takes the viewer to Okemah, Oklahoma; Coney Island, New York; and into the studios to record the Mermaid Avenue sessions. Check out our Online Catalog to purchase this DVD or VHS. 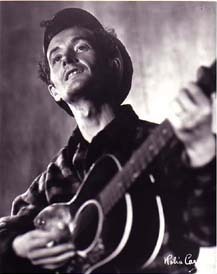 SEATTLE, WA- The folks at Experience Music Project and Washington State Historical Society are hosting a Woody Guthrie tribute concert in Benaroya Hall out in Seattle, WA on May 23, 2001. It will feature both local and national musicians that will perform Woody Guthrie songs and original compositions. The concert corresponds with the traveling exhibition This Land Is Your Land: The Life and Legacy of Woody Guthrie which is currently in Tacoma, WA. The concert will benefit the Northwest Folklife Festival. "California Stars" bats in the Minor League. "Von London in die Dust Bowl von Oklahoma"
Billy Bragg und Wilco singen Guthrie auf "Mermaid Avenue"
Im Econ-Ullstein-List Verlag wird demnächst eine deutsche Ausgabe von Joe Kleins Biographie "Woody Guthrie: A Life" erscheinen. Wir werden Sie auf dem Laufenden halten. REGGIO EMILIA - On February 17, 400 people packed a small theater in Reggio Emilia (Northern Italy) to honor the music and poetry of Woody Guthrie. Passages from Woody's writings were read by Alessandro Portelli while Maurizio Battelli performed songs by Woody, Bob Dylan, Bruce Springsteen and others. News of this event traveled, and other theaters throughout Italy are contacting Professor Portelli to repeat the program in their area. Gratzi!